I have been watching through Sailor Moon as the new subtitled version has been coming out over the last two years (167 episodes and counting! 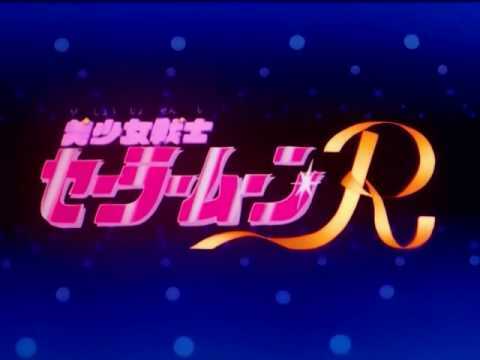 ), and this is the only Christmas episode I know of. It's not a great episode, just middling, being mostly filler. It's Christmastime, and the city is all decorated, but a terrible flu is going around and all but one of the Sailor Senshi is sick in bed. Minako (Sailor Venus) is the only healthy one in the bunch, so she's been going around to her friends' houses to help them feel better. Unfortunately, she's a terrible nursemaid, and a large part of the episode is slapstick surrounding her attempts to cook a good meal or put on soothing music, only to get the spices completely wrong or blow up the stereo. Really, you need skill to fail this badly. When Mina gets to Usagi's place, she finds that Chibi-Usa is feeling okay too, but she's frustrated that no one will let her help while the family is sick. Maybe because she keeps doing things like almost falling off the balcony trying to hang the wash out to dry. (Side plot note, Chibi-Usa is Usagi's time-traveling daughter from the future, although I don't remember how many people know that at this point in the season. 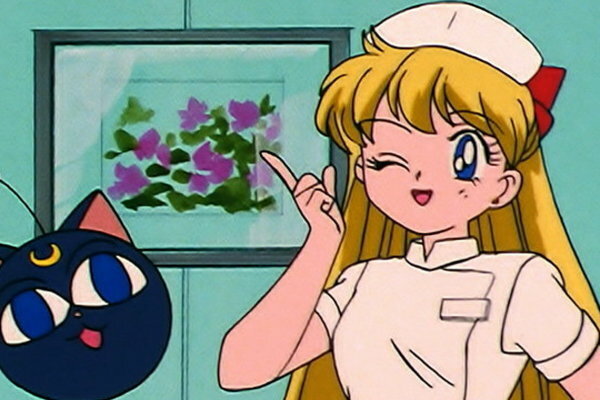 She's pulled a Dawn-from-Buffy-mind-trick and everyone but the Senshi think she's Usagi's cousin who's living with them. She's about 4 or 5 years old, and the bad guys are trying to catch her.) Minako says she'll look after Chibs, but the two of them team up to make even more of a mess. Usagi passes out while trying to keep up with them, and cue a fever dream! I'm mentioning Usagi's dream here because it starts with her on a Christmas date with her boyfriend, which may be the only dialogue reference to the holiday in the whole episode, although there are decorations in the background fairly often. When she wakes up, Usagi finds that Mina and Chibs have actually done an okay job taking care of her until her fever broke, which leads to a cute friendship moment between Mina and Usagi. Mina and Chibi-Usa are then sent off to get some more medicine and end up at a clinic that's oddly deserted. Of course, this is because Esmeraude, villain of this section of this season, has set up shop here, and is causing the flu with some sort of dark power feedback loop. What I mean is, the more people get sick, the more power she gets, so she can cause more sickness. I think that's how it works. The nebulous 'power' or 'heart' or 'dreams' that most of the villains are after on this show is hardly ever well-defined. Of course our protagonists stumble into the bad guys' lair, and Chibs uses the scream-and-glow power that's her main thing at this age to let everyone know she's in trouble. Venus bluffs Esmeraude fairly hilariously, as Esme spills her guts about her evil plan and Venus is all, 'of course I knew that and that's why I'm here!' Venus then takes on Esmeraude and her medical-themed monster lackey single-handed, and does well enough to hold them off until all the sick Senshi manage to drag themselves to the battle. Some sparkly attacks, a little reassurance from Tuxedo Mask, and one Moon Princess Halation later and Esmeraude has bugged out and the lackey is space dust. Everyone feels better now that the dark power isn't making them sick, except Mina, who's sick in bed with only Usagi and Chibs to 'look after her,' with about as much success as she was having earlier. The Christmas elements are thin in this, but it does explicitly take place near the holiday. Still, if you want some seasonal Sailor Moon, you might be better off with the CDs.